Winrock International » What Does Zero Deforestation Mean? Authors: Sandra Brown and Daniel Zarin. Since 2005, negotiations under the United Nations Framework Convention on Climate Change (UNFCCC) have focused considerable attention on the role that reducing emissions from deforestation and forest degradation (REDD+) can play in climate change mitigation. 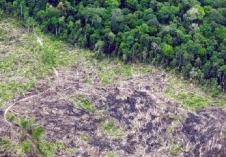 As global interest in reducing deforestation has grown, numerous governments, corporate groups, and civil society organizations have set time-bound targets for achieving “zero deforestation.” Some targets specify “net deforestation,” some “gross deforestation,” and some do not specify at all. Public- and private-sector policymakers who commit to deforestation reduction targets, and those who advocate for them, are often unclear about their implications. This lack of clarity may lead to perverse outcomes, including governments celebrating reductions of deforestation when large areas of native forest have been cut down and “zero deforestation” certification of agricultural commodities produced on land recently cleared of native forest cover. Progress toward goals of forest conservation, climate change mitigation, and associated cobenefits would be better served and more readily monitored by setting separate time-bound targets for reductions in the clearing of native forests (gross deforestation) and increases in the establishment of new forests on previously cleared lands (reforestation). Net deforestation targets, inherently and erroneously, equate the value of protecting native forests with that of planting new ones.